Aquatic therapy is a gentle, effective, water-based exercise program that includes stretching, balance, strengthening, range of motion and stabilization. Your body’s natural buoyancy in water eases the pain of weight bearing on joints while the water provides resistance, making this form of therapy preferred for a variety of medical conditions, including fibromyalgia and rheumatoid arthritis. Water naturally exerts pressure on submerged areas of the body. This hydrostatic pressure increases body awareness and slows movement of the body through the water. The combination of increased physical awareness and slowed movement allows a body to steadily rebuild muscle memory and regain balance. Hydrostatic pressure also helps decrease swelling in joints and soft tissue resulting from injury or arthritis. Warm water relaxes muscles and increases blood flow into injured areas. Patients with muscle spasms, back pain, and fibromyalgia all find this aspect of aquatic therapy relaxing and therapeutic. 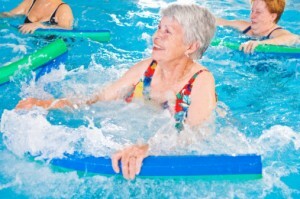 As always discuss with your physician any concerns you may have prior to starting an aquatic therapy program. The extraordinary benefits of aquatic therapy are widely recognized and may be covered by Medicare A and Medicare B, depending on your situation. For more information, please contact RehabCare at The Fountains at The Carlotta.